Google owns Android, the most popular mobile operating system on earth. That’s probably not news to you. What may be news, however, is realizing Google has a window into mobile usage that few could ever dream of as a result. So, when they focus on getting mobile right on one of their many properties, you should take note. Enter their redesigned mobile career center. It’s awesome. Responsive. Fast. Rich in content and branding. Integrates its Google Plus platform. For Google to set such standards is no surprise. Their applicant tracking solution was way ahead of its time 8 years ago, bringing an Amazon-like ease-of-use to its prospective talent pool. I have to imagine Google looked at traffic coming into the career center and recognized the trend of mobile visitors, which I’ll bet was also heavy on tablet usage as well, and took action. The world of HR is infamously slow to change and adoption of new technologies, often letting others blaze the trail that they’ll eventually get to. Obviously, few employers are Google with Google’s resources, but companies of every size have options. Vendors such as Jibe, iMomentous are helping mid-sized and up go mobile for a fee. 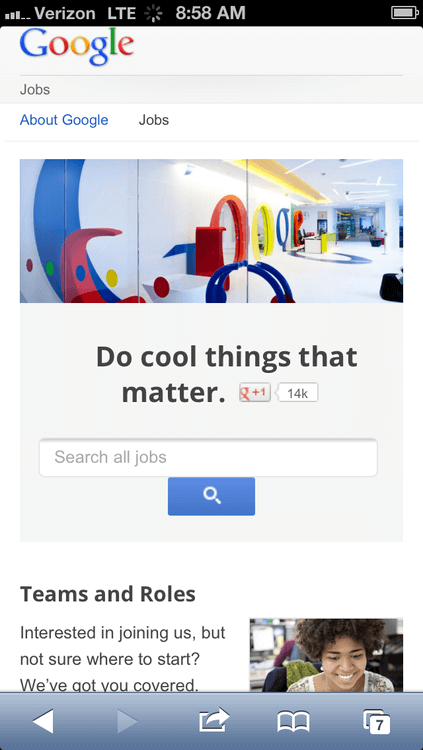 For the most thrift-conscisous, redirecting candidates to your Indeed.com profile page might work as a mobile strategy, as all these pages are friendly to small screens. It’s a strategy with some negatives, like potentially sending candidates to your competition that’s on Indeed’s job search, but comes at a very reasonable price. Should you care about mobile? If you’re an employer, do yourself a favor and go visit the person who tracks site traffic. Ask what percentage of users come in through mobile devices. If the answer is greater than 10 percent, it’s time to add mobile to the checklist of things to do in 2013.